Shredder is dead, but his story is far from over. Oroku Saki is fighting his way through Hell, facing all of his enemies in a horrifying undead gauntlet. Aided by a small rat he thinks is Splinter, Shredder marches on. Will he find some semblance of peace? Or will his warrior's spirit prevent him from rest? As cool as Shredder looks, he's mostly been played as a one-dimensional character. He's the gruff, serious nemesis of the Teenage Mutant Ninja Turtles, capable of cutting you in half if you looked at him in the wrong way. 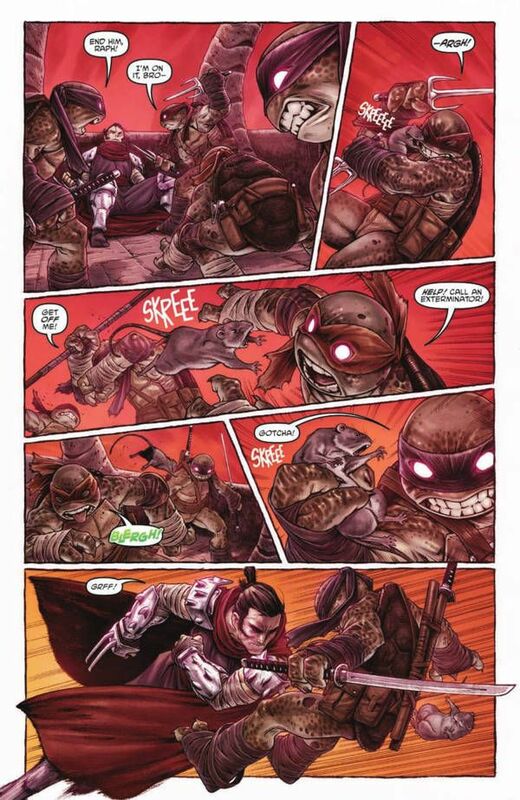 Shredder in Hell humanizes him a bit, showing the inner turmoil he deals with and the many obstacles he's faced on his path both through life and death. It's no wonder he's such a Grumpy Gus. While this series allows us to further explore the Turtles' #1 villain, I wish it had come a little sooner. Saki has been six feet under for some time now, so he's been off the board and not in our thoughts at all. This means the comic serves a dual purpose with Shredder not only fighting his way through the underworld, but fighting back into relevancy. Writer / artist Mateus Santolouco turns in some tremendous work on this front. Shredder's enemies have taken on a demonic look. 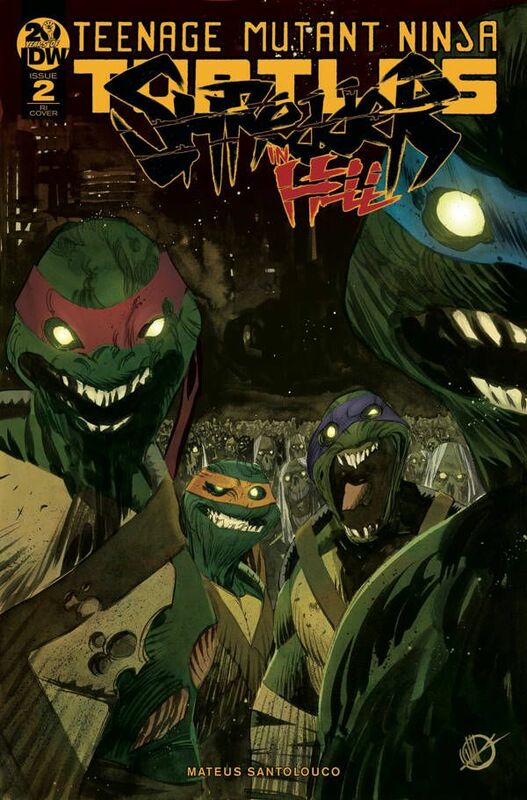 The Ninja Turtles have never looked more frightening than in this book. They're guided by vengeance, reveling in the pain and anguish they're causing. 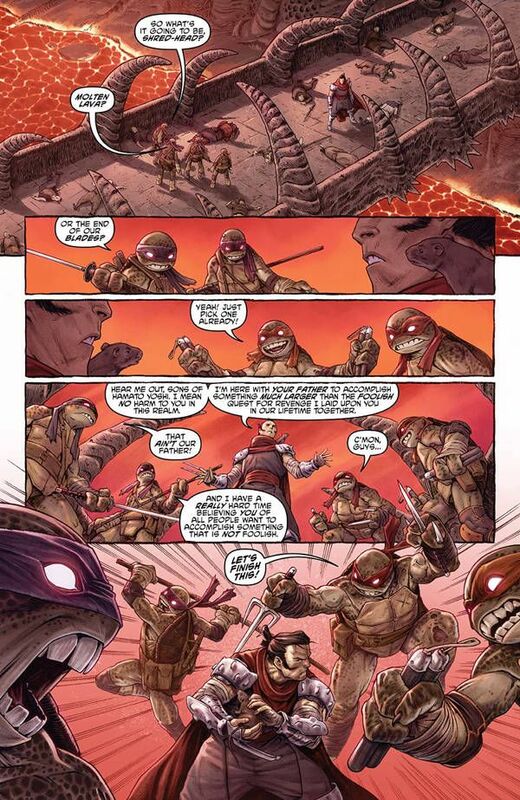 Of course, the heroes in a half shell are just some of the beings standing in Shredder's way. There's a cavalcade of past misdeeds ready to overwhelm him like a zombie horde. Santolouco shows Saki hacking and slashing his way through them, leaving bits and pieces of these enemies behind. These in turn coalesce into a pulsing mass of undead flesh in a sickening sequence. Letterer Shawn Lee adds to the disturbing quality of this scene with the ungodly sounds these creatures make. They start as words and then turn into guttural grunts shown in ever-growing font. You'd think Saki would want to stop after something like that, but he soldiers on. 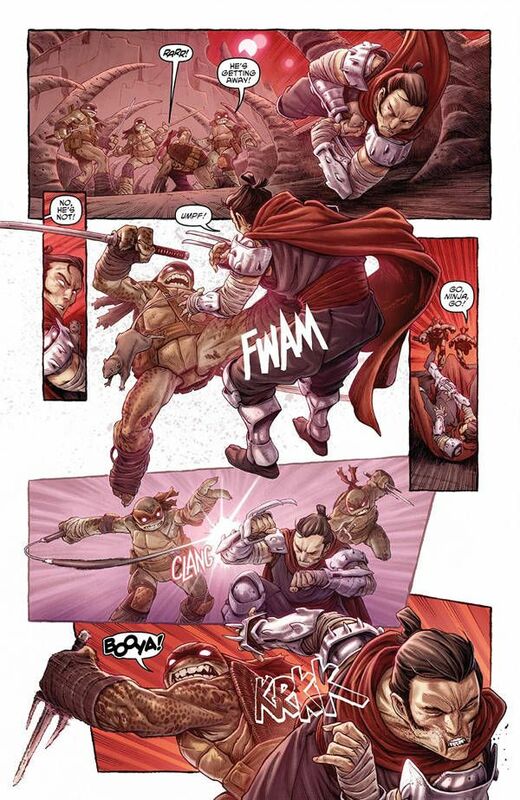 The most moving segment of Shredder in Hell #2 comes when he's forced to relive some of the more violent and painful moments from his life. This is shown in a gorgeous double-page spread, broken up into tons of smaller panels, cobbling together some of the most tragic moments from his past. Colorist Marcelo Costa gives these sequences a lighter blueish hue, creating the feel of memories. This stands out from the otherwise fiery atmosphere of the underworld with its reds and oranges. 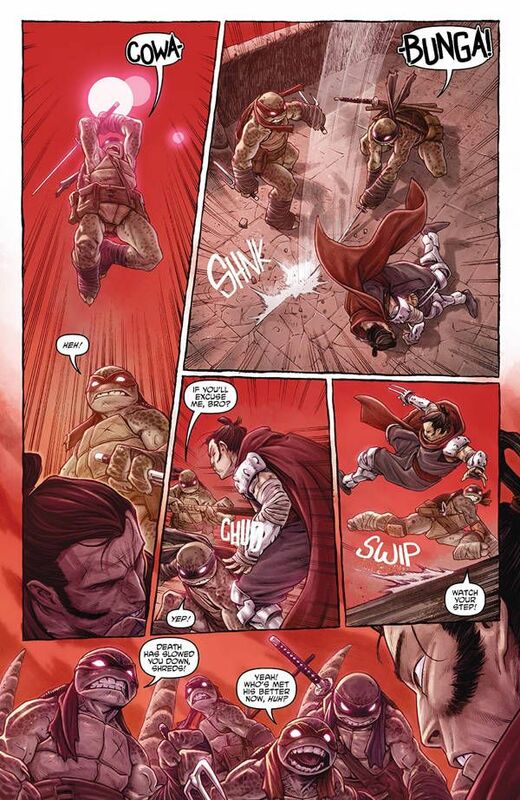 Shredder in Hell is an incredible exploration of the Ninja Turtles' greatest foe. It serves to redefine the character, adding more depth than he's ever had. You can see the seeds for potential future storylines, like the return of the Pantheon, being planted here. 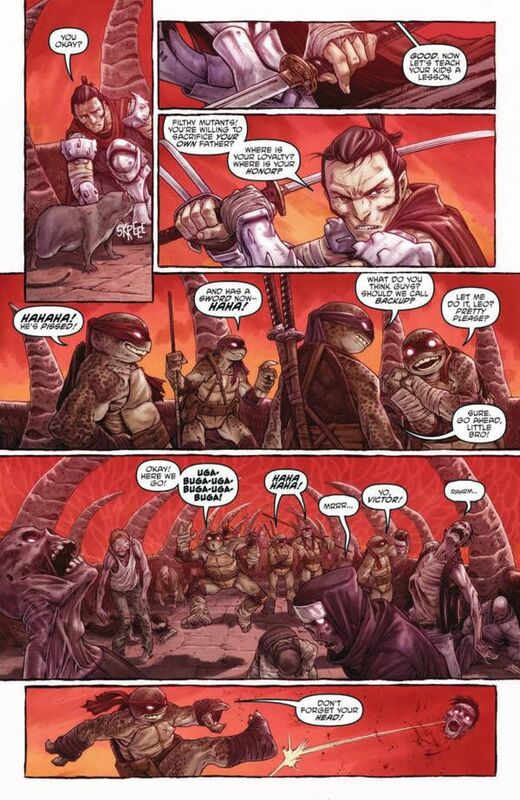 Plus, it isn't every day you get to see some of the most disturbing body horror imaginable in a Ninja Turtles comic, so it's definitely worth checking out.